What an incredible week! In looking back over the course of the past few days it seems as though the week was at least a month long. We were privileged, once again, to play a part in the Ride for the Relay led by legendary Rodger Fox. It was, however, a more emotional experience than usual as it was Rodger’s last run with the tour on Route 66. This was truly the end of an era. With more than 75 riders, this was the largest ride yet. 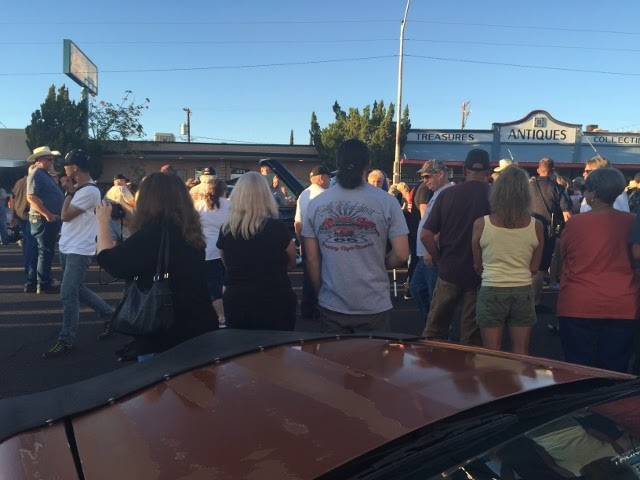 So, we were quite fortunate for the traffic control assistance provided by Police Chief Robert DeVries and the City of Kingman Police Department when it came time for the group to leave the hotel to continue their westward journey. Chillin on Beale, held on the third Saturday evening of every month, April through October, is always a delightful event. Now that the Route 66 Association of Kingman has added Cinema under the Stars it is even more enjoyable. The Saturday evening event was almost beyond description. A special dedication manifested the best of the city and our country. This press release provides the details. SGT Brian Lloyd Walker was born March 3, 1987. After graduating high school from Lucerne Valley, CA, he enlisted in the U.S. Army in July 2007. SGT Walker completed One Station Unit Training at Fort Leonard Wood, Missouri as a Military Policeman. After graduating from Basic Airborne Course he was assigned to the 118th Military Police Company at Fort Bragg, North Carolina, where he completed his first tour to Afghanistan from May 2009 to May 2010. SGT Walker was then assigned to HHC, 425th Brigade Special Troops Battalion, 4th Brigade Combat Team Airborne, 25th Infantry Division, Joint Base Elmendorf-Richardson, Alaska. SGT Walker was attached to HHC, 1-501st Infantry Battalion Airborne in August 2011, where he served as the team leader. SGT Walker was deployed with his company to Afghanistan in December 2011, where he was killed by an IED during a combat mission in support of Operation Enduring Freedom, May 13, 2012 near Bowri Tana, Afghanistan. He was the vehicle commander in the lead vehicle when it was struck by the IED, when he and his driver PFC Richard L. McNulty III were killed. His military education includes the U.S. Army Military Police School, Basic Airborne Course, Combat Life Saver Course, Warrior Leaders Course, and he was inducted into the SGT Audie Murphy Club. His awards and decorations include the Combat Action Badge, the Parachutist Badge, the Army Commendation Medal, Army Achievement Medal, Good Conduct Medal, National Defense Service Medal, Afghanistan Campaign Medal with one campaign star, Global War on Terrorism Service Medal, Non-Commissioned Officer Professional Development Ribbon, Army Service Ribbon, and the Overseas Service Ribbon. He was posthumously awarded the Bronze Star Medal and Purple Heart. SGT Walker is survived by his wife Ashley Walker. The Walkers first met each other while stationed at Fort Bragg, NC where they both were assigned to the 16th Military Police Brigade they had a strong bond and connection, which culminated in love and marriage in December 11, 2010 in Las Vegas, Nevada. Ashley used her tools of motivation after the loss of her husband to win the gold medal for the 2012 All-Army Women’s Softball Team September 20th. “It’s for him, everything is for him,” Ashley said of Brian. Ashley Walker was honorably discharged from the U. S. Army in 2012 and came home to Kingman, AZ, where she then began to start training at Crossfit, ultimately becoming a Trainer. She then studied hard and graduated police academy in Lake Havasu City, AZ on June 2014 and now works for the Kingman Police Department. Brian and Ashley purchased this 1958 Chevy Pickup while on leave in Escondido, California a few days prior to his death, he was heard to be boasting about his new truck and how nice it was going to when it was completed. With the financial support of Ashely and three years later it is complete, this is the first time that Ashely has seen the truck since it looked like the picture on the hood. As the presentation was made, there wasn’t a dry eye in the crowd. This link is for a story published in the Kingman Daily Miner. The presentations and ceremony continued when Ralph Bowman and a team of hard working volunteers debuted the recently refurbished police car, Jingles, named in reference to the towns favorite son, Andy Devine. The historic police car has served as a ceremonial center piece at events for years in Kingman but it was beginning to show its age. The volunteer effort to refurbish the vehicle seems rather symbolic as the entire city seems to been on the cusp of exciting change. Last week JuST Marketing issued a press release announcing a cooperative partnership with the Route 66 Association of Kingman as that organization launches its ambitious Celebrate 90 initiative. The core of the initial announcement was a solicitation for letters of endorsement and sponsors. This morning the association released a more detailed press release about the initiative. I will share this in the next posting. As a kick off for the project, the owners of the historic Dunton Motors dealership, now Dunton Motors Dream Machines, location for the associations office, installed a restored circa 1960 neon OK Used Car sign last Friday. 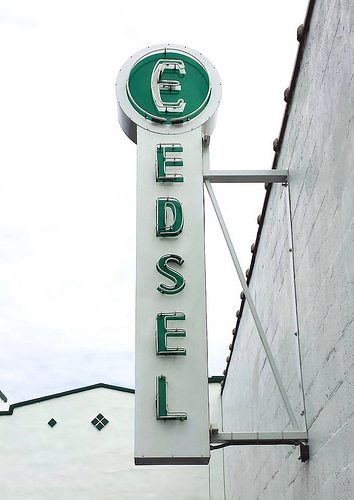 As the facility once served as an Edsel dealership, there are also plans for the restoration and installation of neon Edsel sign. As these are a bit hard to come by a request for an estimate was sent to Joel Rayburn of Glass Boy Studios, a leading manufacturer of reproduction neon signage that recently completed a sign for the Blue Swallow Motel in Tucumcari. The owner of the dealership has recently acquired two historic neon signs, and they are being renovated at this time. One is from the Hotel Beale cocktail lounge, and the second from the Brandin’ Iron Motel. The Historic Electric Vehicle Foundation also issued a press release about their forthcoming plans. In addition, it provides a bit of information about the festivities scheduled for the weekend of October 16. This should be quite a fun filled weekend. In addition to the reception for the National Route 66 Motor Tour that includes the Route 66 Electric Vehicle Museum displays, a Route 66 cruise to Grand Canyon Caverns, a bluegrass festival at Stetson Winery, a mountain bike event, Cinema under the Stars, and the last Chillin on Beale for 2015. 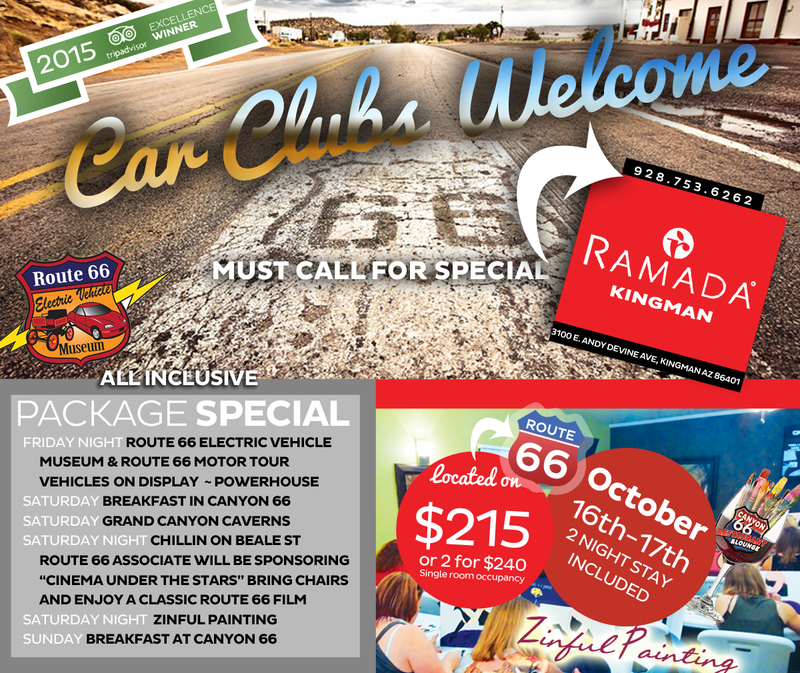 Ramada Kingman continues to be a major supporter of events in the city. For this exciting weekend they have developed a special package that will add real value for visitors. To close this out today, here is the press release from the Historic Electric Vehicle Foundation. With the fairly recent development of cars such as the Tesla model S and the model P90D and the ground shattering developments during the 1990s of electric vehicle racing organizations such as the National Electric Drag Racing Association, www.nedra.com, there is no longer a perception of electric vehicles being dull and boring. Quite to the contrary. However there are many who still do not realize the full potential of this very new and very old technology. With the recent inclusion of the Buckeye Bullet 2.5 electric streamliner, the Route 66 Electric Vehicle Museum in the Powerhouse Visitor Center in Kingman, AZ now covers over 100 years of electric vehicle history and development. The Buckeye Bullet 2.5 was built and first raced in 2009 by students at Ohio State University. It set two international F.I.A. (Fédération Internationale de l’Automobile) records in 2010. It set the kilometer record of 307.905 mph (495.526 km/hr) and the mile record of 307.666 mph (495.140 km/hr) making it the current fastest electric car in the world under international regulations. On the record run of 307.666 mph average the car reached a top speed that exceeded 321 mph. The Buckeye Bullet 2.5 is currently on loan from the Wally Parks National Hot Rod Association Motorsports Museum in Pomona, CA with permission of the owners, Ohio State University. In addition to the Buckeye Bullet 2.5 there have been many new additions to the museum in the last several months pushing it up near capacity. There is Willie Nelson’s classic Rolls Royce style electric golf cart with a wet bar as well as “Gone Postal” an all wheel drive drag racing postal van from the Discovery Channel pilot tilted “Sucking Amps”. There has also been several additions to the electric micro car collection. We are now turning our attention to creating a richer experience for our guests. In the upcoming months we will be doing a major fund raiser to enhance the exhibits with large period photos for our massive wall space. We also intend to hire a full time person to explain the exhibits and add a more personal touch to the experience. In addition we will be upgrading the theater and including pertinent videos to go along with the exhibits. We want our guests from around the world to leave wishing to return to see what is new and exciting on their next visit. 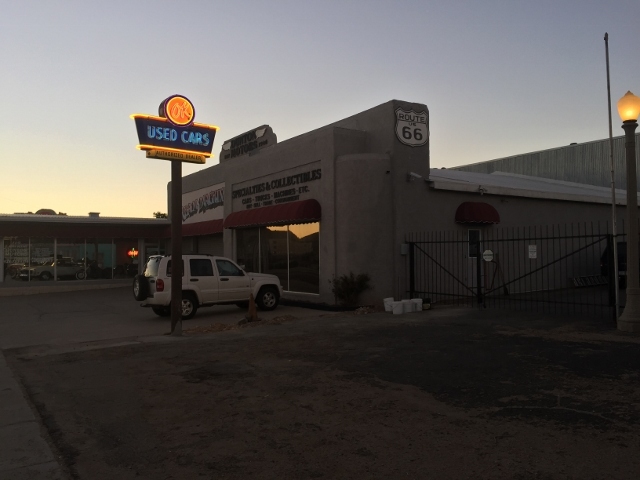 Next month on October 16th the The Route 66 Electric Vehicle Museum will be held open in the evening to accommodate the reception for The 2nd Annual National Route 66 Motor Tour which is being hosted by Kingman Area Tourism, Route 66 Association of Kingman, and The Arizona Route 66 Association.